Honda's Insight: The "hybrid for everyone" attracted hardly anyone. 1. Chrysler rejects 789 dealerships while in Chapter 11, and General Motors, on the threshold of bankruptcy, decides to ditch 1,350 more. The seemingly random mass firing spawns a dealer uprising and creates a distribution omelet that Congress tries to unscramble. 2. GM's attempted sale of its Opel unit in Europe to Magna International and the Russian state bank Sberbank. 3. Toyota unintended acceleration. Toyota Motor Corp. execs fall into the old corporate pattern -- deny the problem, debase the victim, delay in responding -- rather than come clean. Toyota gets rebuked by the National Highway Traffic Safety Administration and earns a heap of bad publicity. 4. Ed Whitacre tells Germany and Chancellor Angela Merkel that GM doesn't need state aid for Opel. He brags to the Muenchner Merkur newspaper: "If Mrs. Merkel doesn't want to give us anything, then we will pay for it ourselves." Now GM Europe's Nick Reilly has to kiss a lot of hands and feet to get the badly needed cash to help Opel. 5. 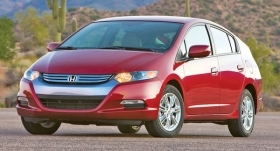 The Honda Insight. Supposed to be the "hybrid for everyone," it sells to virtually no one. 6. 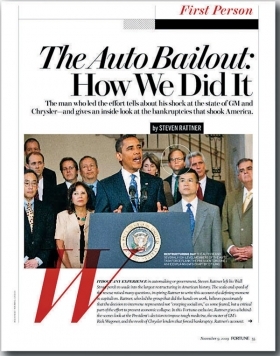 Writing in Fortune magazine, former auto task force head Steve Rattner says Fritz Henderson asked not to be called the interim CEO of General Motors Co. Rattner quotes Henderson as saying: "You can fire me anytime you want, but at least give me a better chance to succeed." OK.
7. Porsche acquires Volkswagen. How did that work out? 8. As part of its reorganization, GM demands that surviving dealers get non-GM brands completely off the premises by the end of the year -- then realizes it meant to say the brands just had to be in separate showrooms. GM to dealers: Never mind. 9. Planning and organization of cash for clunkers. Congress debated it for months -- which cost thousands of sales -- then imposed hasty, overcomplicated rules and dumped it in the lap of understaffed NHTSA, which was arbitrary in the way it enforced the rules and very late in reimbursing dealers. 10. Former Valeo CEO Thierry Morin, who stepped down in March, imitates Richard Nixon and secretly tapes Valeo board meetings. Morin says he was merely taking notes ... but other directors weren't amused.